If ever we needed a good-time band to give us a lift and make us smile, this is that time. During The Great Depression, movie houses were jammed with patrons seeking escape and a chance to just tune out their troubles for a little while. Now is not so different; between all the distressing political and environmental news, it can be a real challenge to keep on smiling, but this band is bound to help with that challenge. Ted Stevens and the Doo-Shots are seriously silly, wildly talented, focused on fun, and a great escape. For Boomers who may have forgotten and millenials who don’t yet know this music … which the band web site describes as “revved up rockabilly and surf…” we’re talking about light-hearted, good time music you could almost describe as “silly.” Even the “sad” songs give a giggle (Drivin’ Nails in my Coffin Over You) and are definitely danceable. And these guys have got a million of ‘em. Well, O.K., maybe not a MILLION, but a couple hundred per gig anyway. What is it about this music that makes us feel like “Oh what the heck!” when we were in a bad mood a minute ago? Of course a lot of the appeal depends on who’s playing it and how; the trio of Ted Stevens and the Doo-Shots is made up of three pretty darn happy guys who sound as if they were born to this sound. 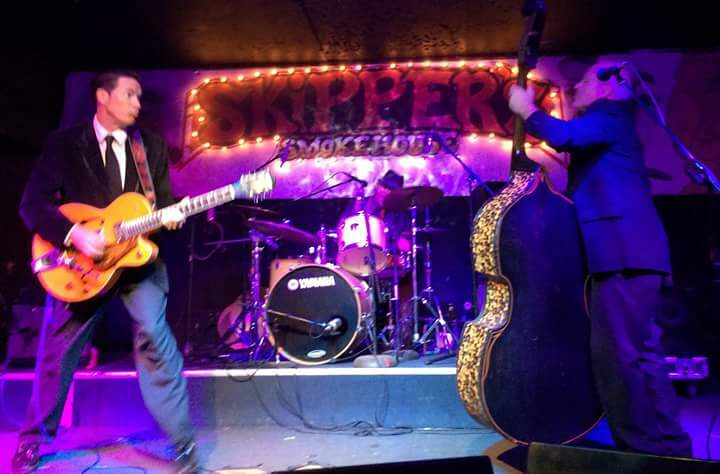 Guitar player and vocalist Ted Stevens is the highly entertaining front man and band leader who moved to Sarasota in 2008, primarily for the boating and fishing lifestyle. He’s a native of Rhode Island but came to us by way of Vegas after having played for years in casinos there. (And in April 2018 had a little blast from his past when he went back there to play the Viva Las Vegas Rockabilly Weekend, complete with the Doo-Shots.) Ted’s repertoire is pretty much unlimited in that he listens to and has played many genres of music and spent stints performing most of them at one time or another. But when it came time to settle on a signature sound, it was the rockabilly and surf sound good-time music he saw few other bands embracing and chose to share. Starting over in southwest Florida, getting just the right mix of guys for the group and figuring out where their music would work was a big challenge at first, but talent will out and at this point the band can pretty much enjoy the luxury of being able to pick and choose gigs. One of the first rooms they played on Siesta Key was Gilligan’s; they’ve been loyal to the venue, and vice versa, ever since. Joe must be one of the most energetic guys on two islands: a gifted, award winning journalist with the Anna Maria Island Sun, his brain gets a good workout at his day job, then he evens it out with the good physical workout he gets playing drums for the roots rock music that has him double-timing a lot … and when you’re doing a bunch of tunes at that pace, you are workin’. His wife and greatest fan, Amy, is at lots of his gigs and they have a pretty full life of their own, which includes doting on their much adored dog-daughter, Mabel. Full disclosure: I know a little bit about Joe because we both came to Florida from Holland, MI and met when we covered a lot of the same stories on Anna Maria Island, where he was a generous and gracious guide to my new territory even though we worked for competing publications. Good guy. Joe’s been with the Doo-Shots since 2010. In 2012, the other half of the hard-driving rhythm section joined up; Butch works the stand up bass that helps give this music it’s unique, rootsy sound. 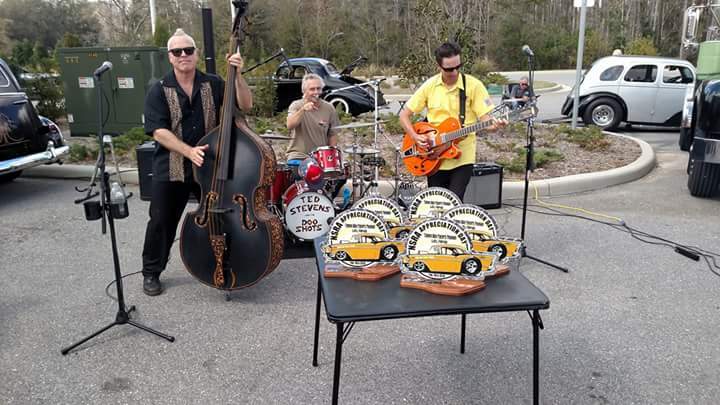 Most of the gigs are a bit of a drive from his home in Wesley Chapel but he deems it worthwhile and does it not only for full band gigs but also for the duo dates he and Ted do. Though Butch bills himself as the contributor of “crappy back-up vocals” that’s just a little self-deprecating musician humor, as you can hear in the music samples on the band page https://www.tedstevens.net/music, on the five CDs the band has out (and another in the works soon), or at any of the gigs. 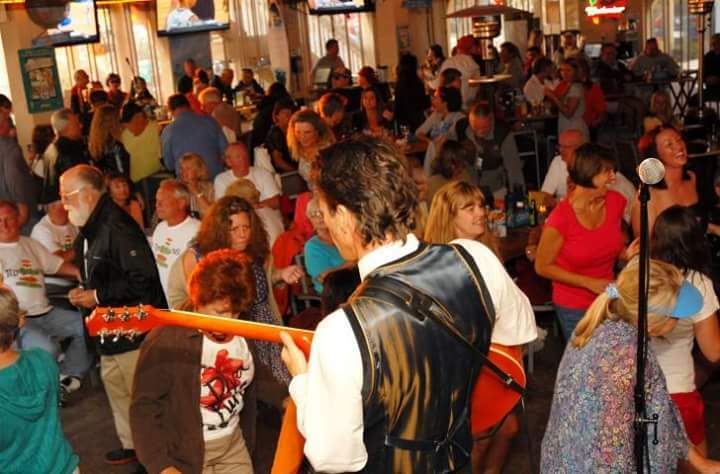 Speaking of which, Gilligan’s in Siesta Village welcomes them back on Saturday, September 15, so come on down and rock!